I was the one who suggested that we go swimming. Because it was just too hot. Even for Provence. Hastily, I had balled up a swimsuit to throw into my overnight bag, just in case, some sort of instinct pushing hope to the forefront. Wouldn't it be lovely if. And yet once my proposal had been accepted and readily by the man that I am seeing with a casual "allez" (in that long drawl he has sometimes), I realized that it was time to actually put on that suit and assume it. It had been a year since I had tried. A year ago, when one of my ange-gardiens (you know who you are) would assure me out of my near homelessness as if it were nothing on her beautiful estate. Hard times do not always make one lean. Despite my still healthy eating, I have put on weight. Or back on to be more precise. Is this normal for the course at a hiccup away from 49? Is it hormones (I just had a blood test done so will at least have a response for this possibility)? Such a hard subject for me, where my desirabilaty (or lack of) was...the reason cited for a very important turning point in my life. In the heat of his bedroom, I stretched and pulled the nylon of my suit, suddenly also aware that my legs weren't shaved. My belly balloned so that my breasts were less covered. All of me wanted to shut down, to cancel, but he called me, "On y va, my sweet?" and so with a gasp or a sigh, I am not sure which, I quickly buttoned a white shirt and shorts, shuffled on the espadrilles and bundled into his camionette. He is a good driver and I need that reassurance after the accident that was the beginning of the end of my last relationship; one that has left me jitterish as a passenger. But with the windows down, and some sort of beautiful music playing, usually un air africain, I feel safe. As we went, I forgot my hesitations, only reminded by the trickle of sweat running down my spine trapped by nylon. And then, carving through the base of the rockiest part of the Alpilles, we arrived. I won't tell you the address. 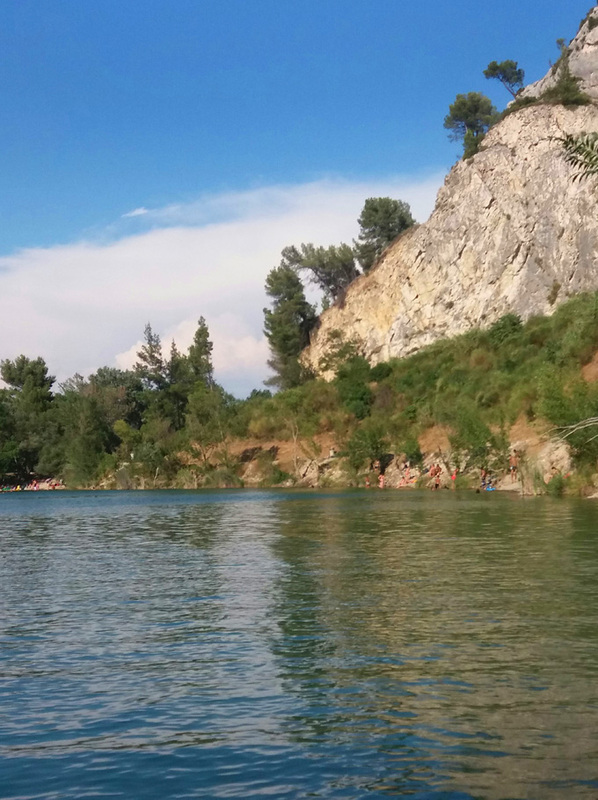 In true provençal style, it is not indicated on the road, this lake, fresh with water from the spring, and yet there it is. Don't idealize it please, for even in its small form, it is already annecdoted with a "snacking", a tiny fake beach and even a Zepyr line for waterskiers. He sensed that me, so private, tensed. "On peut aller plus loin, d'accords? Trouver un petit coins tranquille. Ça te va?" Yes please for a place beyond. In my fatigue these days from my work I am not always as tolernant of crowds and crave peace even in public. We found it. It really was not obvious. A barely there trail leading down to the water at the farthest reach of the lake as the rest of the alcoves had already been taken under such a fiery hour. But somehow, he spied that tiny scrap of land that was shaded (needed for me). The ground is shale and under my espadrilles the rocks slid too easily. I held on to the tiniest branches to guide my way; they snapped under my clutch. He hacked away others to make room, always a gentleman. Where we perched, I cracked open a beer so cold, me who never drinks it save for under such circumstances when only that particular bubbly will do. Holding onto the tree umbrella-ing above our heads, I tipped my toes into the water. Warm. And so off with the clothes, although not the self-awareness. The rocks on the edge, leading in, were slightly painful to touch with my now city feet. "Dive in! All at once!" he encouraged from the sidelines. I did my version of the Américaine and tip-toed out beyond the depths of my reach. Until I inhaled deeply, and plunged into the black blue cold. I am not a good swimmer. Me, a double Leo lion, swims with her head above water. And so I did. Save that finally, I was too tired. So I flipped over on my back. My body, this again belly, buoyed me up. To the last rays of the sun, to the looks that the man that I was with was giving me so gernerously from the shore. I gave in. For some moments, yawning divine, I felt held by the water. And for the first in many months, I thought of absolutely nothing. He swam out, not to find me but to roam. He went far, into the last rays of the day. But he turned back. And with determined strokes, his head rose and fell across the water until he reached me, found, floating. Please be really kind to yourself. I hope this is a man who just wants you -- who only sees you, not any extra pounds. (Which, I suspect, are at least partly the result of the stress of a full-time job, which leaves you with less time and energy to exercise.) And the swim sounds heavenly. We've been invited on a boat ride today. I'm bringing my bathing suit and will think of you if I take the plunge. The ending of this is exquisite. Beware of any man who loves you for your looks. Beauty can be the cherry on top, but if it's the whole cake, look out. And yes, in the late 40s, our bodies start to change until we no longer recognize ourselves. Round butts become flat and flat stomachs become round, even if not a gram changes. C'est la vie. I suspect your man loves not what's outside but what's inside...in your heart and your head. Lovely story! So happy you had this respite; to say it’s well deserved is a gross understatement! The parts that struck a chord with me were when you talked about thinking of nothing and when you urged us: “please be really kind to yourself”. These are two of my problem areas of late! Hope there are more lake-dwelling, mind quieting, supportive partner days in your future! Oh funny you should mention it. Today is my first day on a five day juice cleanse Five pounds in five days. It's so hot here fresh juice tastes pretty good. Hmmm double leo, very interesting. No wonder I read your blog. Oh boy....do I love your stories and the way you write them. Taking a break from a long work to do list...tasks that must get done by the end of the work day. Now I feel refreshed, more thoughtful and ready to dive back in but also reminded to just relax and to find some water this weekend. Brooklyn public pools...look out for my 49 year old arse. What a lovely day you spent privately swimming/floating! Sounds like it was a much needed respite. Your companion sounds like a caring & thoughtful person. So important for developing a loving & nurturing relationship. Try to make more time for days like this, Heather. You deserve the relaxation & renewal that they bring! Back to you: I'm glad you're here. such lovely -- and true -- writing. . . I adore every word. I re-read it and re-read it again. It's so cinematic. You are. Are you sure, you dont want to write a book? Such lovely words! Such perfect timing this post of yours! After four years, the last being here almost full time I've set today as the day to enter the Mediterranean . . .who can live in Greece for four years and not be in the water, right? Well soon I am going to stuff (I hope) this 65 year old body into a swim suit (and if you think a 49 year old body is a shock - wait until the sags of the sixties hit!) Good post. . .I'll let you know if I sink or swim! Beautiful, honest and therefore courageous post! I know I haven't written for a long time going through things... But now is the time to try again. I think I know where it is but I won't tell. I've been there probably two years ago trying to get over that rock to continue our trail but we had to return and take another way because the stones were too slippery. What a fail because we ended up on the big road to get back to where we came from. Isn't it exhausting (voire triste) how much woman quarrel with the shapes of their bodies? We shall love our bodies with bellies and unshaved legs. I know it is hard! But it is a way of self-discrimination we commit. We need to work against it. So congratulations, dear Heather for the decision to go swimming! You would have missed that great experience of the lake for what? Most men would'nt have thought twice about it. So I am glad you did it and wrote about it. And so beautifully too. And who said a belly is not desireable? ça n'a rien à voir avec! Be proud of who you are and the long way you came. Be proud of your coolness! And of course check your health because thats what is important. I wish you all the best and that you succeed to find a job that does not exhaust you too much. I know it is hard that kind of a job! For us sensitive creatures. Thats why I admire even more that you did it. Wish you Love and lots of Strength! Namaste! outside ... your beauty shines through. Oh your story took me back to a very similar event. Body image has always been such a mixed bag for me. Now that my love is gone and I’ve had a mastectomy, and my leg scars will never go away, I fight this battle off and on, in some fashion, almost daily. Many times I can give myself a good positive talking to, but other days or circumstances (like water environments, or hot weather when people are wearing shorts and tank tops), I am a big fat failure in the confidence arena that I am really ok -lots of doubt there. I admire you so, slipping into a suit and down the rocks and into the water!! Your friend sounds so great! I had a great experience like that when I was in college and his positive words are as clear and wonderful today as they were 50 years ago! We definitely are our own worst enemy but it sure feels good when we see the light and know for the moment we are ok and are beautiful. I’m happy for you!! Oh he sounds like a nice man. As a pisces, I LOVE the water, but on land I feel like a beached whale. I have decided, however, not to care about that anymore. I bought a suit with boy-shorts and I am loving it. This is not to say that I am not working on shedding this extra poundage (and yes...it came with menopause, I'm sorry to say) but to try and accept what joy is in the moment. Thanks for the reminder to be kind, I'm not always kind to myself...I still have those awful moments (thankfully just moments) of self-loathing before I remind myself to be grateful for this 60 year old very-healthy-if-no-longer-pretty-body. I am a creature of the water. I will swim for 1.5-2 hours, letting the freedom of being almost weightless envelop me. Being in the water is my happy place. But alas, it's impossible to find a private spot these days. It seems all the secret spots have been discovered. 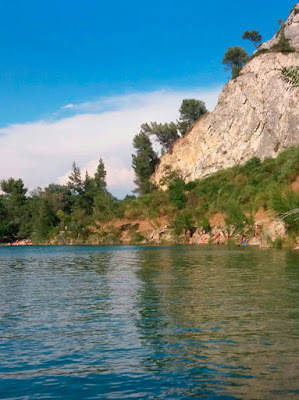 I hope you have enough free time to enjoy summer in beautiful Provence. Like you, I am not fond of crowds so it makes it difficult to leave the house when the island is engulfed by tourists from May to October. What's the saying about dance as if no one is watching? You go, girl! P.S. Now who can say they can float at 701. After several hospital stays, now 77, I'm going to try to enter, stairs are stairs, the pool on Sunday. After I try to get into my bathing suit. After I find it. Please write a post about why you think you have broken up, if you can.